Getting A Second Passport And Establishing A Part-Time Or Full-Time Offshore Residency In One Of Over 20 Beautiful, Get-Away Countries... Starting In Just 30 Days Or Less! Never in the history of South Africa have ordinary people... Just like you... Had so much of their hard-earned incomes stolen from them through exorbitantly high income, property and capital gains taxes that seem to increase without end each and every year. Never before... Have people had to live according to so many complex statutes, laws, and regulations (most of which are completely useless - except to classify you as some sort of "criminal" in the eyes of the law...And keep vast numbers of lawyers, bureaucrats, and government workers fat and happy in their jobs). As an experienced financial analyst and investment strategist, Gavin believes without a shadow of a doubt that you can have a life full of personal freedom, wealth and abundance by learning the latest strategies contained in his new report. Powerful Information You Were Never Told About! Here are just a few of the many powerful and life-changing secrets that you will discover in this information-packed, essential "field guide" to international travel and living. • The top websites and contact information for over 10 foreign embassies and consulates that will take the hassle out of "going offshore"
Simple. Because when it comes to living a millionaire lifestyle anywhere in the world, there's no-one more qualified - period. After getting his economics degree and starting several successful businesses, many of which he is still involved with to this day, Gavin went on to become a well-respected investment strategist, Forex trader and stock broker. You may have seen Gavin on Good Morning Africa, or heard him appear as an expert trading and investment guest on South African business radio stations such as Chai FM or CNBC. Today though, when he’s not sailing around the Cape peninsula or relaxing on the beach in sunny Miami, Florida, Gavin is best known for his work as the former editor for the popular South African investment and lifestyle newsletter, Unconventional Millionaire. Through this publication, Gavin taught thousands of South Africans how to make, save and grow their money and live the millionaire lifestyle for less than you ever imagined possible. Gavin has truly been around the global block. And while he still believes South Africa to be one of the best countries of the world...The sad yet undeniable facts are that the South African way of life has continually gotten worse over the past 50 years. So Gavin compiled this book to help people just like you create more options for living and getting back control of your life. After all, your life belongs to you. Gavin has only made a limited number of copies of this indispensable guide to the millionaire lifestyle available. In fact, there are only 89 copies left in circulation, and they are already selling out - fast. And if you're interested in what I've told you so far, you can act on my special offer below... and get a gift worth R495 to boot. YES, Reserve me a copy! THE PASSPORT REPORT is guaranteed to educate, enlighten, and empower anyone looking to expand their personal freedom and increase their travel options. That is why you MUST add this indispensable report to your personal library. It will become your go-to reference guide for any time you travel or live internationally...Even if you take short trips to the UK or Mauritius. • How a second passport can save you from incarceration and possibly save your life! • Where you can live like royalty for less than R2,500 a week! Beware of your eroding democratic rights- and your income! I'm not trying to scare you. I just want you to know what’s going on when it comes to your rights. They purposely make the legal "system" more complex for you because they don't want you to understand it. You'd Be Crazy To Say "No!" 100% RISK-FREE For 30 Days! You can own Gavin’s, indispensable book today for just R695. You won't find it in any store. The only way to read it for yourself is to accept your copy from this exclusive invitation right here. Then, keep your copy for 30 days - read it, explore it from cover to cover. This is plenty of time to check out the dozens of powerful and life-changing secrets contained inside. And...If, for any reason, or even no reason at all you're not 100% satisfied, then just return your copy... And I'll send you a full and fast refund of every cent you paid. Imagine...All of the doors to opportunities you have only ever dreamed of that will be opened to you...All because of reading this guide. Just click the "order button" below, and you'll soon receive the most important book that is currently missing from your personal library... Including INSTANT ONLINE ACCESS to the R495 Special Bonus Report when you respond in the next 7 days! Yes! 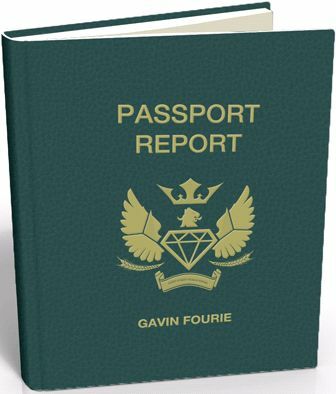 I’d like to order a copy of the Passport Report so I can discover powerful and life-changing secrets to international travel and living. Along with your copy of The Passport Report, you'll also get a FREE subscription to our daily Money Morning newsletter, so you'll know what's happening in the markets and never miss another profit opportunity again! If you'd prefer not to receive this e-letter, please check this box.